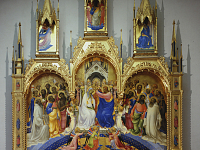 Fabriano’s piece, Adoration of the Magi, painted for the Palla Strozzi’s Chapel in the church of Santa Trinita and now in the Uffizi Gallery, is considered a masterpiece of the International Gothic style. 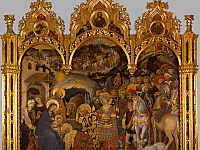 This work, alongside his other piece, Flight into Egypt, are noted as Fabriano’s best creations. Born in the town of Fabriano, Gentile di Niccoló di Giovanni di Massio, called by his birthplace, worked throughout Tuscany, Venice, Florence, Siena, Orvieto, the Sant’Angelo in Vado municipality in Urbino and also in Rome. He worked in the Palazzo Ducale di Venezia (Doge’s Palace) in Venice, The Santa Trinita (Holy Trinity) in Florence, The Duomo di Orvieto (Orvieto Cathedral) in Orvieto, the Duomo in Sant’Angelo in Vado and the Basilica di San Giovanni in Laterano (Basilica of Saint John Lateran in Rome. 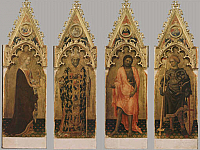 Much of Fabriano’s work has been lost, including his pieces for Doge’s Palace, where he was assisted by the young Pisanello (1395 – 1455). Fabriano also trained prominent artists such as Jacopo Bellini (1396 – 1470) and influenced great artists such as Fra Angelico (1400 – 1455). Both Bellini and Fra Angelico, became important contemporaries of Fabriano along with the Quattrocento Renaissance painter, Masaccio (1401 – 1428). Fabriano was very well known for his elegant, decorative style and for his delicate touch of lighting.